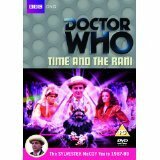 In his post-regenerative confusion the Doctor is separated from his young companion Mel and tricked into assisting the Rani in her megalomaniac scheme to construct a giant time manipulator. The time: 1959. The place: the Shangri-La Holiday Camp, South Wales. The Doctor and Mel want time out. The hedonistic alien Navarinos wants to catch some vintage rock and roll. And two CIA agents want to know what happened to their countrys missing satellite. When the beautiful Chimeron princess Delta shows up on the scene, the murderous Bannermen soon follow in hot pursuit. The stage is set for a fiery showdown that will decide the fate of an entire civilisation. Ace Adventures Box Set: In these two classic stories Ace joins the Seventh Doctor aboard the TARDIS where shes soon battling a biomechanoid and liberating a world where just feeling sad can get you shot! 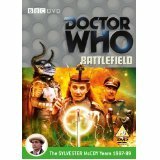 Dragonfire - On the planet Svartos, the Doctor (Sylvester McCoy) and Mel unexpectedly encounter an old friend  Sabalom Glitz. Joined by Ace, a teenage waitress with a love for explosives, the group ventures off to find the fabled Dragonfire treasure. London, 1963, and the Doctor returns to Coal Hill School with his new companion Ace, where he has unfinished business. His oldest foes, the Daleks, are on the trail of Time Lord technology  an artefact the Doctor himself left behind on Earth. Enlisting the assistance of the local military, the Doctor must protect the Gallifrey an secret of time travel as two opposing Dalek factions meet in an explosive confrontation, with the fate of the entire Universe at stake! The Happiness Patrol - On the planet Terra Alpha, the population constantly displays happy smiles. Anyone feeling remotely glum disappears. Quickly. 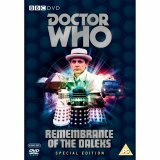 Having heard disturbing rumours, the Doctor (Sylvester McCoy) and Ace arrive to topple the entire regime. The beacon has been set up to warn space traffic of a new satellite orbiting Jupiter, but one craft is taking no notice of the order to stay clear  a Cybership. The satellite is Voga, Planet of Gold, home to the seemingly harmless Vogans  but why are the Cybermen so determined to destroy it? Although Ace hates clowns, the Doctor decides to take his companion to the Psychic Circus on the planet Segonax. There they find a group of scared performers who live in fear of the sinister and creepy Chief Clown. But what is so dangerous about this particular circus, why is there such a small audience and will Ace be able to overcome her fear before its too late? 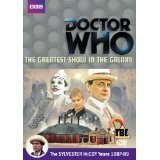 The first story from the final season of Sylvester McCoy's tenure as the Doctor. 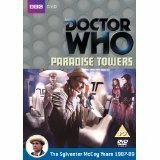 The Doctor and Ace arrive on Earth in the late 1990s where they become involved in a battle between King Arthur and Morgaine. However, these are not the heroes of Britain's past but warriors from another dimension - and they recognise the Doctor as the wizard Merlin. As usual it is down to the Doctor and Ace to save the planet, but this time they find some help in the guise of the Doctor's old UNIT ally, Brigadier Lethbridge-Stewart. London, 1983: an old house mysteriously burns to the ground. One hundred years earlier, the Doctor and Ace arrive at a sinister mansion in the rural hamlet of Perivale. Horrors old and new await the Doctor amongst the peculiar residents of Gabriel Chase, but it is Ace who must confront her own worst nightmares when she discovers that her past and the houses future are inextricably linked. 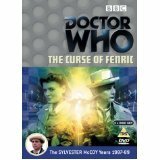 Doctor Who: The Curse of Fenric is one of the best of Sylvester McCoys Seventh Doctor adventures, a complex tale set around a naval installation on the North Yorkshire coast during WWII. The busy plot involves a Russian commando unit, a code-breaking computer, opening gambits in the Cold War, ancient Norse inscriptions concerning even more ancient evil, a new twist on vampirism, chess, global pollution and a creature from the end of human history. 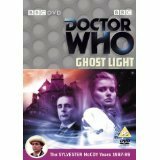 Key to all this is the theme of faith and a time paradox centred on Ace (Sophie Aldred), which ultimately turns out to be the resolution to mysteries that have haunted the Doctors companion all her life (they were first touched upon in 1987's Dragonfire, also written by Ian Briggs).